Especially now when 90% of the press conferences on media day at the North American International Auto Show in Detroit have company execs talking all things “connected” and “autonomous,” but few things “driving,” we have to hold onto the “halo” cars and trucks like a D-Day Marine to his rifle. As necessary or inevitable as all that autonomy may be, it doesn’t mean we have to forget the drive, right? You do have to look closely to see the familial resemblance between the Raptor and its F-150 brethren. The headlight lenses are undeniably similar, but when you’ve got fenders this swollen on their outsides, well, it’s kind of hard to tell. Same goes for the taillights. There is more in common than immediately meets the eye, however. 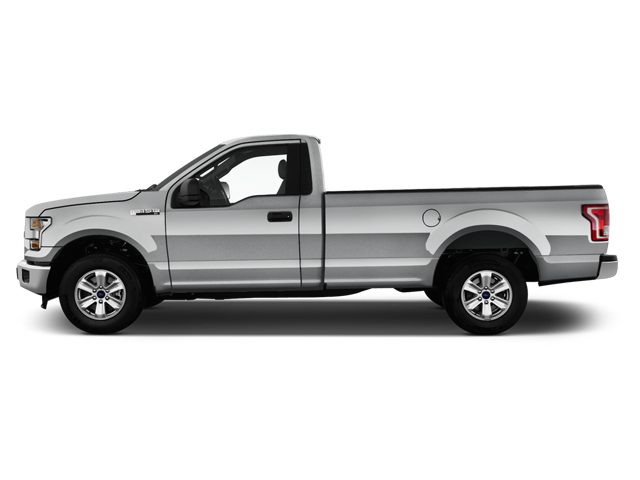 For instance, the cabin (available in either crew cab or king cab format) is shared with both the standard Ford F-150 and Super Duty trucks. They don’t get those graphics, though (optional as they may be), nor do they get those big 19” wheels (available in two styles) or specialized Bridgestone KO2 tires. Ford worked directly with Bridgestone to modify the tires to suit the various environments the Raptor was engineered to tackle. There’s also a beadlock option, although federal law prohibits them to be sold as such so you have to buy the beads separately from the dealer. Other exterior modifications include twin 4” exhaust tips (tucked high into the chassis so not to affect departure angles), an enlarged hood with functional air intakes, and a modified grille with amber marker lights required for vehicles over 6’ wide. The rear tailgate, meanwhile, gets two designs: one with small badges reminiscent of what’s seen on other F-150s, and another one with “FORD” written in Tonka truck-style block letters. The latter is probably the way I’d go; it just suits the bigness of the Raptor so very well. Inside, the story is similar; with the exception of some optional trim pieces, you’ll know you’re in a Ford F-150. Same gauge cluster, same centre stack; even the shift lever (console-mounted only; other F-150s get a column-mounted option) is a direct lift. The most obvious addition is actually an optional interior colour scheme ($950-1,250) that’s almost as bright as the truck itself. The seats are black leather, fine, but the piping is bright orange, matching various orange-weave carbon trim pieces throughout the cabin. I think it’s kind of funky, but my drive partner would likely have chosen “gaudy” as his preferred adjective. Another noticeable addition over the standard F-150 is the series of auxiliary switches above the rear-view mirror, which can be used to install all manner of spotlights, LED strings, and so forth. The great part about sharing a cab with other trucks in the lineup, of course, is that you still get all of the goodness that helps make the F-150 such a big seller including a comfortable driving position, easy-to-fold seats, and a crew cab with legroom to equal an SUV. You sit a little higher, of course—33” (330 mm) of lift from the 9-stage FOX Racing dampers will do that—but that’s really the only giveaway. Outward visibility, control placement, storage; it’s all the same. It’s testament to Ford ensuring that the F-150 Raptor, while being an off-road performance giant in every way, can still be used as a day-to-day truck, one that is just as capable as others in the range. In a word, yes. There are plenty of people who will buy a Raptor and likely never use it to within 60% of its capabilities. They will happily make their daily grind in one of these, but they will have to make some compromises. Not many, mind you, but a few. For starters, this is not a truck you want to spend too much time on winding roads. It’s wide, it’s tall, those tires are huuuuuge, and while Ford’s chassis engineers have done a pretty good job of keeping the body in check, there’s only so much you can do to defeat physics. As a result, the new F-150 Raptor does get a little squirrely under these types of loads. And of course, there’s the small matter of getting up and in if you’re shorter. The standard fixed side steps certainly help, but there’s not much you can do to change the floor height. It’s nice that a retractable step is also standard. That’s pretty much the extent of it, though. Get past that, and the Raptor’s strengths take hold of you like a proper enthusiast’s ride should. First of all, there’s the power. That’s 450 hp and 510 lb-ft of turbocharged torque from a 6-cylinder EcoBoost powerplant at your disposal, and coupled with a 10-speed transmission it makes itself felt right away. And heard, too: those twin tailpipes are mighty free-breathing. If that wasn’t enough, engine noise is electronically boosted through the speakers. The transmission, it should be said, is a pretty marvellous thing. There are 10 speeds, but any number of those can be locked off to prevent the transmission from shuffling through the gears too much when under heavy loads, such as towing or climbing. Flipping the surprisingly large and effective paddles to move through that many gears is actually pretty satisfying. The transmission carries out each shift in whip-crack fashion—we’re talking proper performance car levels, here—and the way it interacts with the engine is such that you really want to string it out on the road, as lairy as that can sometimes be. That, there most definitely is. It starts with the drive modes, six of them: Normal, Sport, Weather, Mud/Sand, Baja (oh my, yes! ), and Rock Crawl. These modes play with the traction control system, power distribution, and transmission to make for a very different feeling truck depending on the circumstances. Of course, you can also lock the differentials, turn it into a rear-wheel-drive muscle truck, or completely defeat traction control. We were given the chance to put the 2017 Ford F-150 Raptor through its paces on an icy and snow-covered off-road course at Quebec’s Mecaglisse motorsport facility. We started off in “Normal” mode (the one with the most active nannies) and we found the truck to be as confidence-inspiring and capable as it looks. Those Bridgestone KO2s are amazing in this stuff, and it’s easy to see why Raptor engineer Ed Krenz enthusiastically calls the tires a “win-win-win” for Ford. They, of course, are aided by the constant shuffling of power to the wheels that can make the best of it and also by a responsive steering. Even Normal mode allows for a bit of slip, which, in turn, makes you feel like a hero. The pass in “Sport” mode in 2L was the real eye-opener, however. This is a truck you can drive on the edge in these conditions, carrying out proper, controlled drifts while you’re at it. It may look mean, but it doesn’t necessarily drive as such. You normally shouldn’t be able to go this quickly in these types of conditions in a vehicle this large. Then, as you hurtle toward the many depressions and lumps you come across, you know the Raptor’s dampers are going to make it so everything stays copasetic no matter the speed at which you hit said obstacles. Try to hit the bump stops; go ahead, I double-dog dare you. It is possible—a 100mph drive on some off-road terrain at the Raptor’s development facility did it last year—but it takes quite a lot to do so. How does this type of track work apply to the day-to-day? Well, if you are an off-road hobbyist, you’ll know you’re covered and then some, that’s for sure. Even if all the off-roading you do doesn’t extend much past wintry drives to the cottage, the peace of mind is there. Not that you’ll be thinking all that much of any modicum of “peace of mind” the Raptor provides. Really, what it’s about is blending some pretty blinding on- and off-road performance with the practicality of a pickup. It has a very specific modus operandi and it hits the target, to be sure. Do we miss a V8? No, but many will, most likely. For a time, anyway, because once you realize that you’re getting more power with less weight than previous (meaning more capability and better efficiency), you’ll see the benefit. The new Ford F-150 Raptor remains a beast on the road, as its name suggests, and it continues to be a testament to what’s good in the driving enthusiast world. Sure, it’s got optional active lane keep assist and adaptive cruise control, but that’s as autonomous as it gets. Huzzah for that.